Halloween has long been known as one of the least environmentally-friendly holidays. Between countless candy wrappers, costumes made of harmful plastics, and decorations which burn a lot of energy; it can be hard to navigate a holiday which means so much to so many. Luckily, here’s Grades of Green’s Guide to an Environmentally-Friendly Hallo-green! Costumes sold at Halloween super-stores are often made of materials like PVC which contain phthalate. These materials may be flame-retardant but they end up in a landfill leaking toxic chemicals into the environment. In fact, extended exposure to these chemicals could have adverse health effects. Host a costume swap! Just like with candy, everyone likes a little variety in their costumes! But rather than shell out cash for a new costume every year, host a costume swap with your friends and mix it up! If you’re unable to find friends in your size, join Grades of Green’s virtual costume closet! 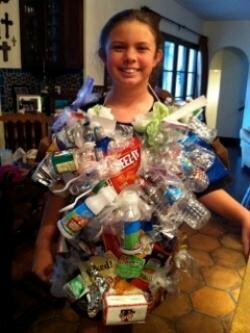 Design your own costume using supplies you already have at home! Another way to save some green while going green, create your own hallo-green masterpiece from things around the house. Grades of Green’s Litter Monster is not only a great costume, but is a great way to raise awareness for waste reduction efforts. You can also turn an old bridesmaid’s dress you’ll never wear into an undead party-goer with some homemade fake blood. Take an old yoga mat and turn it into a slice of pizza or a British telephone booth. Not only are the costumes and decorations comprised of materials which are non-combustible, the plastic packaging they come in only compounds their harmful impact. Rather than spend money on decorations which will likely be thrown out in November, recycle egg cartons into bats or make skeletons our of recycled milk jugs. Old stockings with tears can be made into spider webs, add a construction paper spider and your hallo-green party will be the talk of the town. The opportunities are endless and it can make for a creative DIY project for the whole family. While we would love to reduce waste, handing out candy which is not individually wrapped may not go over well with concerned parents. Instead, you can hand out organic goodies with a significantly smaller environmental footprint, like these organic lollipops. Host a pot-luck hallo-green party and ask your friends to bring their contributions in re-usable containers. Halloween parties can be a huge perpetrator of environmental efforts due to single-use plastics. Hosting a potluck party using silverware instead of single use cutlery will significantly reduce the holiday’s environmental impact. Avoid hard plastic jack-o-lanterns that will never breakdown in a landfill. Instead using tote bags, reusable shopping bags, or a pillow case to collect goodies is an easy way to be environmentally-friendly. Instead of driving to your trick-or-treat destination, walking will help reduce the number of dangerous pollutants we expel into the atmosphere. Not to mention that it will help burn off the countless calories consumed later that night! Use solar panel lights to illuminate the path toward your haunted mansion. Sweep your sidewalk when clearing a path for trick-or-treaters; you’ll be saving gallons of water by not using a hose. Buy organic and shop local! You’ll protect water and reduce carbon emissions by picking up your pumpkin from your local farm. Click Here to locate your local family farm. Save the seeds and pulp from your pumpkin to make delicious snacks and baked goods. By reusing or composting our unwanted pumpkin parts, we can reduce dangerous greenhouse gases. Check out our favorite recipes for Roasted Pumpkin Seeds, Pumpkin Pie, and Pumpkin Soup. Our Water Campaign Student Teams will tell you that eating a meat-less pumpkin based meal would be protecting water. By reusing the pumpkin seeds and pulp we reduce waste. For more fun ways to reuse, recycle and reduce waste, register for our Waste Campaign now! For more DIY projects, green activities, and other ways to remain environmentally-friendly, visit www.GradesofGreen.org. Send your green solutions or pictures of your Hallo-green Holiday to @gradesofgreen or send us a message on Facebook!